David Bustamante is a Spanish pop singer and songwriter born on 25 March 1982 in San Vicente de la Barquera, Cantabria. Bustamante is among the promising Latin pop singers in Spain. Bustamante gained fame in 2001 as a third-place winner on Operación Triunfo, the interactive musical reality television show that went on to achieve the highest audience ratings in the history of Spanish TV. He released his debut album, Bustamante, in Spain in May 2002 and in Latin America and the United States in 2003. In 2004, Bustamante released his first album with his sophomore outing, Así soy yo (That’s the way I am), which was – for the most part – produced by the well-known Emilio Estefan in Miami. In the same year he recorded the intoxicating theme song of “Gitanas”, a superb, highly thought-provoking telenovela (Latin soap opera) that was filmed in Mexico and ran on the Telemundo network in the United States. His other great hits included Pentimento (2006), Al Filo de la Irrealidad (2008) and A Contracorriente (2010) all reaching the top of the Spanish Album chart and going Platinum. In his career, Bustamante has sold more than 2 million records -albums and singles combined- in Spain and Latin America, getting 15 Platinum in albums, digital downloads and mobile ringtones. By 2016, eight of his nine albums had reached number one in Spain. He released his latest hit is “Lo pide el alma” in 2017. Bustamante is married to Spanish actress, model and it-girl blogger Paula Echevarría since 2006. The couple has one daughter called Daniella Bustamante Echevarría born in 2008. The couple divorced in 2018. David Bustamante with his wife Paula Echevarría. Bustamante is currently in a relationship with Yana Olina. David Bustamante the Spanish singer and songwriter has an estimated net worth of $4 million dollars. The bets went from 0 to 20. She is all that a man hopes for. I am an error anywhere. And I am a crude bindweed. I swam against the current and betted on nothing. Make a dream a reality. And I could raise the flight behind its golden skin. I know that there are no rules in the name of love. Someone said that the heart doesn’t lie. When it’s true, you feel it. Don’t think about it with the mind. The bets go from 20 to 0. And in the night I stole a bright star. It’s the story of a sincere love. While it attains nothing, it realizes the impossible. David Bustamante y Yana se han proclamado ganadores de la primer edición de Bailando con las estrella s. El cántabro se ha enfrentado a Manu Sánchez, que ha sido la gran sorpresa del concurso, mientras que Patry Jordán ha demostrado que su evolución ha sido espectacular y ha dejado impresionado al jurado en su último baile. Las tres parejas han tenido que realizar tres bailes, demostrando su capacidad física y de aprendizaje desde el primer día. El jurado ha dado una segunda oportunidad a cada pareja para repetir uno de los bailes de galas anteriores. Cada pareja también ha tenido su oportunidad de elegir otro baile que quería repetir y en tercer lugar han podido realizar un freestyle con el que sorprender al público. David Bustamante and Yana Olina have played a tango, a cha cha and a freestyle dance to the rhythm of The Phoenix . 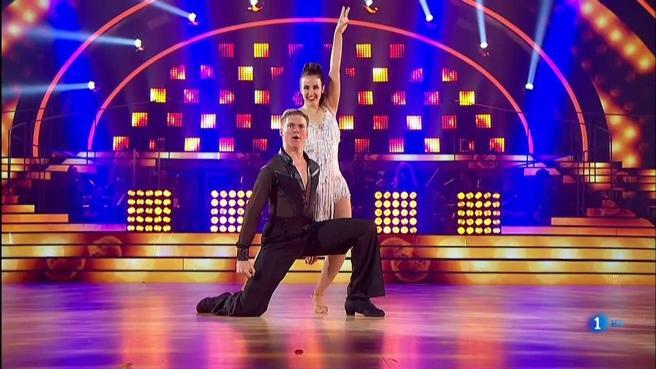 Patry Jordán and Rubén Salvador, the great rivals of Yana and Bustamante , have shown that they have improved their jive , that they have not forgotten the waltz and have selected the song Like it for their free style. Manu Sánchez and Mireia Arizmendi, the big cap of the contest, have shown off their particular version of the paso doble, and have faced a fox and A lovely night have been unleashed in their free style. The most intimate moment of the night has been lived with the meeting of all the contestants of the program. The celebrities have joined together with the professional dancers of Dancing with the stars to perform I wanna dance with somebody at the beginning of the gala. So we have seen again Rossy de Palma, Merche or Topacio Fresh, the first expelled from the contest. Joaquín Cortés, Moira Chapman and Isabel Pérez have given their point of view to each dance, although today they were not responsible for the final decision. It has been the public, through calls and SMS messages, which has proclaimed David Bustamante and Yana Olina as the winners of the TVE dance talent .